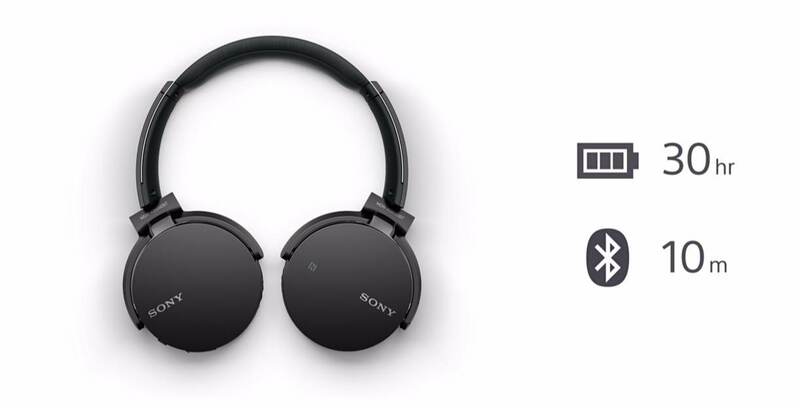 MDR-XB650BT is a Bluetooth compatible, compact addition to the existing EXTRA BASS series of Sony headphones. With a 30mm driver exclusive to this range, together with an incorporated bass booster structure and dedicated EXTRA BASS diaphragm, the headphones achieve highly realistic notes that precisely carves out the rhythm and groove feeling of rich bass. Keeping you wire-free, One-touch Bluetooth connection and music playback is offered via NFC. Compatible with AAC and aptX Bluetooth codecs, it enables a premium audio quality sound even when listening wirelessly. The headphones have been designed specifically to enhance the playback for deep bass. Fitting with an increased contact surface area, it achieves a stable fit that can withstand the punchy and deep bass notes. The ear pads have a soft texture and fit close to the skin, achieving excellent wearing comfort and well-balanced sound. The swivel structure design enables the housing section to be folded flat, making them easy to store and convenient to carry around wherever you go. With 30 hours of continuous music playback rechargeable anywhere via USB, your party won’t stop even at the break of dawn. The new EXTRA BASS MDR-XB650BT headphones is priced at RM549 inc. GST and now available in Malaysia at all Sony Stores, selected Sony Centres, as well as www.sony.com.my from March 2016 onwards. Sony Malaysia introduces 40-inch W650D BRAVIA LCD series. Be a MySony member and be privillaged!